Some players have noticed the discrepancy between the breathing symbol key just under the exercise title (right aligned) and the symbols over the first few bars of music. This is due to either 1) limitations in the Lilypond (free, open source) music engraving software or 2) my own learning curve with the software given my time frame for realizing the exercises for publication. The upside-down “v” always indicates an easy exhalation, letting out of air. The right-side up “V” even if it looks like a string player’s up bow symbol always indicates an inhalation. 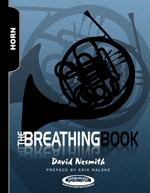 In the first measure of the example, the first two beats are for an easy out breath, the third beat (without a symbol) really means to rest in the place of muscular neutrality (no exhaling or inhaling), the fourth beat small “v” symbol means to begin inhaling (but as if you are not going to play), the fifth beat large “V” symbol means to inhale more swiftly, gathering appropriate air for the phrase. Ideally, I should have included a dashed line over the duration of the fifth beat to indicate that the inhalation does, indeed, fill the whole beat while thinking the subdivision notated.